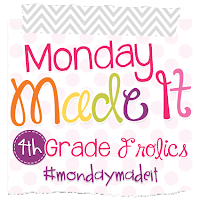 Pinkadots Elementary : Monday Made it! First time trying spray paint! I am SO excited I can actually link up with Tara this week for Monday Made-It, and I can finally focus on SCHOOL projects, now that my summer has started! I don't know about you, but I am not the craftiest person. The thought of painting something is scary enough, but when you add paint in a can that sprays many feet away, I am pretty petrified and certain of a disaster. If you remember pictures from my classroom for the past few years, it has been hot pink and zebra. Although my room couldn't have been brighter, I was ready for a change. I decided to change up all of my bulletin board borders to teal and white chevron. I love teal and hot pink together, so that became my new theme. I am excited to finally be starting some projects for my classroom (now that summer school is finally over). Up first was #1 of many Sterilite paper sorters. I struggle with organization and this year I will have 75 students, I need to be on top of things. I came across some free labels that I feel in love with on TPT. They inspired me to try to make a pretty paper sorter. I decided to label the three trays, Morning Work, Home Work, and Lined Paper. I will only have 24 students for ELA so this will work out perfectly. I have and am SO excited to use our new weekly morning work for the WHOLE year that is given out every week in a packet. I also have homework in packet form for the whole year. Every Monday, I plan on stocking this bin and leaving it up to the students to get their materials for the week. I think this will be a great responsibility for the students to take on and develop into a routine. The bottom drawer for lined paper will just be a helpful and neat place to keep paper for every day projects. So how did I do this...well that is the fun part of this post. I picked up the spray paint at Walmart for $3 a can. I made sure it was special paint to apply onto plastic. I bought hot pink and teal, but only have used the teal so far. I grabbed an old plastic table cloth and put it on the grass outside. I placed the Sterilite container on the table cloth, shook the spray paint a few times and started to spray. A freak rainstorm came out of no where and soaked me, my container full of wet paint, and my table cloth...so I ran in the house. Five minutes later I tried again...When I started to spray the container, some flying bugs jumped on the pretty container and got stuck! Every time I tried to brush them off, I ruined my paint job. At this point, I gave up and brought it into the house to dry. Later on I tried a second coat and it covered everything (included the dead bugs) up. Because of that crazy experience I have learned some tips! Check the weather before painting outside. Paint in the sun where bugs won't bother you. Use a plastic table cloth, piece of material, or old sheet to protect the ground, BUT use weights to hold down each side. Shake the can (like the directions say) for a good two minutes and while spraying. Spray 6-8 inches away from the object and keep your hand moving. Light and thin coats work best. I think my first project of the summer was pretty successful. I was not scared away by the spray paint and will definitely be using it on future projects. 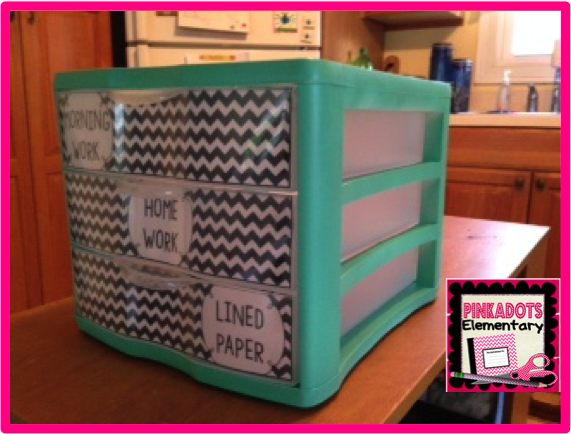 I already started making over my teacher tool box because I found matching labels! I will post more about that...when I finish! I hope this will help you and inspire you to brighten up your classroom with a little paint! You are brave! I'm not a fan of spray paint. Too risky!! I love this idea. No more boring white plastic in the classroom! The honesty in your story is great and sounds about right. I also had the same failure last summer. I had a similar experience while trying to spray paint my black file trays yesterday! I learned NOT to spray paint on newspaper. At least they ended up pretty! Okay....this is literally the third post I've read where someone has spray painted plastic things. It's something I've always thought about, but haven't yet tried. You've totally inspired me to do it, now that you've figured out all the "kinks" for us! Thanks for sharing! This must be the year for spray painting. I went from neons to camo and Duck Dynasty, so have painted all my tubs greens, black, tans, etc. Tried 3 kinds of paint and everything looks great. Glad I did it! I spray painted a couple this weekend. They look great but have already scratched and some of the white is showing through. Did anybody have this experience? Hey, at least the weather wasn't so bad that the wind took the spray and had it land on your school's brick walls. Oops!! Lol. I use the same kind and will be finishing up tomorrow. Have a great year! This had me cracking up! I'm going to Walmart to buy my paint right now! I loved the honesty. How refreshing and truthful. Thank you. Yes you encouraged me to try painting something. Thank you! Thanks so much for your great ideas! I did this at the beginning of the year and the kids have a ton of scratches in them and it left paint marks on the wall when they pushed the paper tray into the wall. Has anyone else experienced this? Oh no! That's horrible! Mine still look freshly painted and they are two years old! Do you remember what brand of paint you used? Did you do anything to the plastic to prep it for painting?